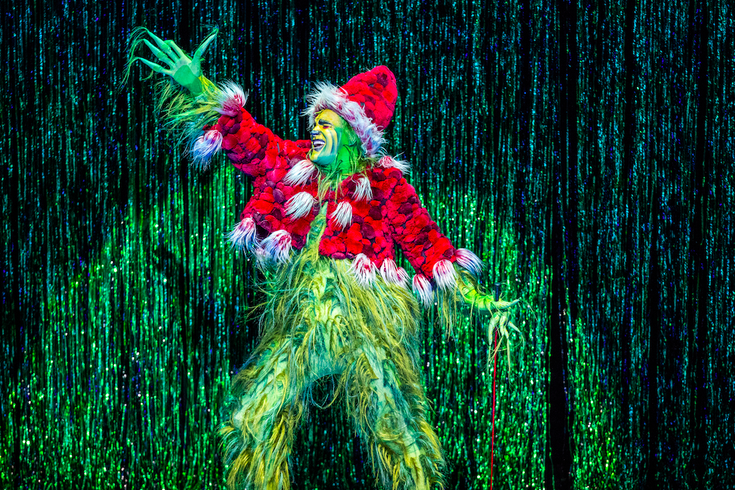 The Grinch in the production "Dr. Seuss' How the Grinch Stole Christmas! The Musical." We now know how the Grinch likes his cheesesteaks and his opinion on Gritty. The grumpy and green Dr. Seuss character agreed to an interview with PhillyVoice, and while the Grinch maintained an air of mystery, everyone's favorite grouch did share some interesting tidbits about himself. Wednesday, "Dr. Seuss' How the Grinch Stole Christmas! The Musical" will open at the Kimmel Center. Before checking out the show – in town through the end of December – read on to discover what the Grinch daydreams about, his favorite holiday and his thoughts on Tastykake, soft pretzels and "The Fresh Prince of Bel-Air." Out of all the cities you've been to, how Grinch-y is Philly? Oh, Philly is fantastic! From its artery clogging cheesesteaks, to its glorification of fictional characters as beloved monuments. I think I’ll do well here. What's your opinion on the Flyers’ mascot Gritty? It’s difficult to have an opinion on a subject that has no meaning. Can you tell us about your childhood? What triggered you to hate Christmas? What is this childhood of which you speak? I’ve never had one, never wanted one, and find it grotesque that you would even mention such a thing. What do you hate the most about Christmas? You would honestly have to be completely insane to understand the reasons. I’m starting to question the integrity of this interview. How factual is the song "You're A Mean One, Mr. Grinch"? Do you really have garlic in your soul and termites in your teeth? It’s all flattery, actually. And yes, it’s all true! It feels good to be so admired that they wrote a song (and musical) about ME, ME, ME! Since you’re not a fan of Christmas, what is your favorite holiday? Silent auctions of bankrupted Whos estates. Are the Whos really that bad? What do you do to relax when the Whos start to get on your nerves? I imagine rolling a tiny snowball down Mount Crumpit, and watch it gather mass as it nears Whoville. Then finally I'll believe in Christmas miracles, as that ball crushes the town and all its holiday spirit. Why do you think Max the Dog is so loyal to you? Do you ever wear pants? That’s a very personal question and I refuse to participate in such silliness. What’s something surprising about you that not many people know? Steamed cabbage with mashed beets and relish cream sauce. Okay, let's do a lightning round! You can only pick one. Gritty or the Phillie Phanatic? Liberty Bell or Rocky Statue? Reading Terminal Market or Philadelphia Museum of Art? Yes, please go there and leave me alone. Tastykake Butterscotch Krimpets or Tastykake Peanut Butter Kandy Kakes? I honestly don’t know if you’re even speaking the same language anymore. "Wooder ice" or soft pretzel? "Boy Meets World" or "The Fresh Prince of Bel-Air"? Honestly can say I’ve got love for both...I don’t need to follow your freaky rules! The “Rocky” movies or “Creed” movies?